What’s with all the gym shoes hanging from power lines? Clearly, gym-shoes hanging on a wire is something that happens. But getting to the bottom of why — that proved difficult. Despite Reddit threads, a Snopes article citing “no one definitive answer” to shoe-throwing, and even a mini-documentary about shoe tossing across the globe, at first all we found were whole lot of theories. But, we were able to turn up enough first-hand accounts and interviews with community leaders, gang members and sociologists to tease out some of the basic theories. Among those theories: Shoes are tossed on account of losing a bet or taunting a victim or, from kids just being silly. In a more serious vein, people said the shoes signify where to buy drugs; they memorialize victims of gun violence; or they represent a crew marking their block. Let’s start with a theory confirmed by an unidentified WBEZ listener who dialed the Curious City hotline and told his own story of shoe-throwing in his youth, which was spent in Cleveland, Ohio. I think I was 14. It was about 1970, and I was wearing my gym shoes around my neck tied together by the laces. A friend of mine, who was perhaps not the best friend in the world, liked to taunt me to some extent. And he was throwing my shoes up in the air pretending, I think, that he was going to throw them over the wire across the street. But then he succeeded. And there they hung. Eventually, some time later that month, the shoestring broke and I got my shoes back. The wager theory is common across the Internet, too. WBEZ listener Juan Molina dialed us, saying that’s how he encountered the phenomenon. I lost a bet and my buddies throw my shoes up there. So, pretty much what they did was climb it — a pole — and threw it up there. Other times we threw it from the street until they got caught. ... We tied the laces together and threw it up. On his message, Molina gave us another reason: spite. I did it once because I survived soccer camp. … I did not want to go to soccer. It was something my parents forced and I ended up throwing it up there. Those were just regular Nike cleats. So what about the gang and urban violence angle? For that I asked my friend Patrick Starr, a guy I’ve known for years who is serving a life sentence in a Missouri state prison. He was a high-ranking member of the Bloods gang back in the 1990s in Kansas City, Missouri. Today, he coaches other inmates on cutting ties with their gang. I figured he might be able to help me get to the bottom of whether shoe-tossing was associated with gangs or urban violence. He said that when he was young, he’d throw shoes up on the power lines to let folks know his crew, the 57th Street Rogue Dogs, ran that block. 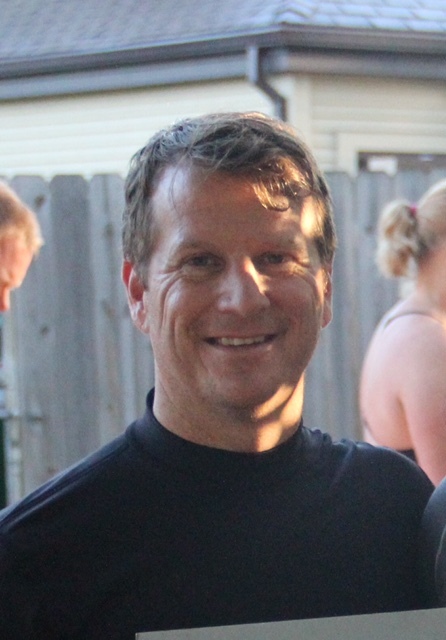 “To us in Kansas City it was about your crew and y’all marking your neighborhood,” he said. With that, he told me he’d ask around the prison yard and get back to me. The next day I got a call. He’d asked fellow inmates and gotten some interesting responses. “The Chicago guys, and a lot of the St. Louis guys, they said that represented guys who were killed from each neighborhood — whether it is gang guys or just homeboys from the hood or the block,” he said. Starr said there were so many inmates that had something to say on the subject, that word started to travel around. “It kind of turned into a nice little yard topic to where guys were starting to run up and say, ‘Oh, hey, man, this is what that meant in my city or my town.’ Or, ‘We don’t know nothing about that,’” Starr told me. OK, so let’s recap. So far we’ve figured out that shoes on power lines mean most of what we originally thought: a memorial to a friend who passed, a crew repping their block, a bully, and kids being bored. But we’d yet to hear anyone tell us that they sold or bought drugs under a pair of sneaks. We talked to Chicago police but they declined to comment. So we asked some more people — kids around the neighborhoods, sociologists, a South Side priest and Cobe Williams, a community outreach worker who has spent years working in troubled neighborhoods in Chicago. When they did have a theory, it was that the shoes were a memorial to someone who died. Not one said they linked it to drugs. Another sociologist I corresponded with, Randol Contreras, grew up in the South Bronx and had his own fun tossing his shoes up on power lines. He now works at the University of Toronto and is the author of The Stickup Kids: Race, Drugs, Violence, and the American Dream. He said that when he was growing up, sneakers hung from wires in every single neighborhood he lived in. “I even threw an old, worn pair of my own sneakers up to hang,” Contreras wrote in an email. “However, as I got older, I saw it happening less often. Aspholm feels the same way. For him, throwing his shoes on the power lines was the pastime of a bored kid who spent a lot of time outdoors. Along with the myriad stories about exactly what shoes on power lines mean, we uncovered some interesting data. 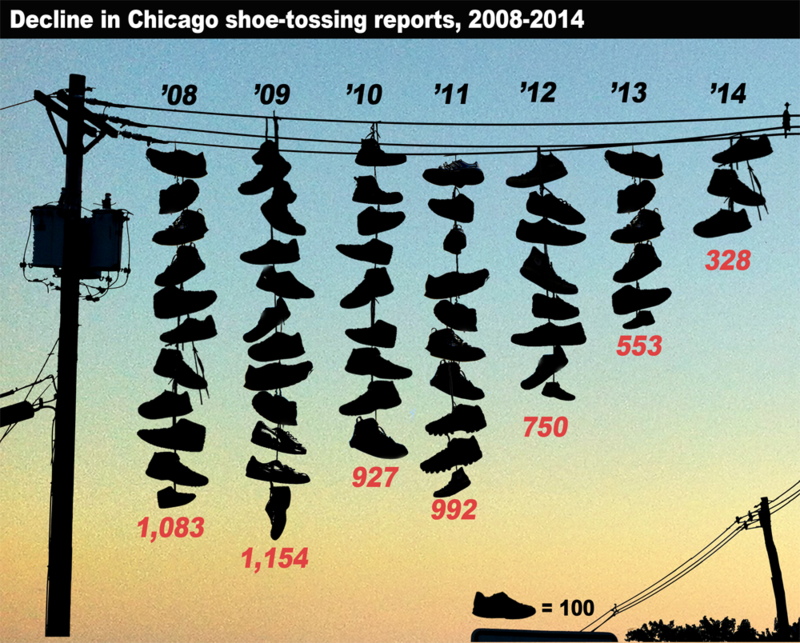 According to Mike Claffey, a City of Chicago spokesman, requests for removing shoes from power lines have dropped by 71 percent between 2008 and 2014. This year, as of June, the city has received only 111 requests to remove shoes from power lines, compared to more than 1,100 in 2008. When we pulled similar data from all the 311 calls requesting to have shoes removed, it showed the same trend, with the concentration of the requests coming from the South and West sides with a pocket in the far northeast of the city, around Rogers Park. I also spoke with ComEd, who maintains power lines in Chicago alleys. (The city maintains the streets.) A spokeswoman, Liz Keating, told me that while ComEd doesn’t keep records of the shoes they take down, anecdotally their technicians notice few on the North Side of the city and far more one the South Side. It’s worth noting that Aspholm said he believes the reason theories around shoe-throwing so often veer toward gangs and drugs and territory issues, are because there is overlap. Maybe Aspholm is right. Maybe the reason behind shoe-tossing is just this simple: a coming of age story of inner city youth, colored by its own regional quirks and mixed up in the larger urban milieu of gangs, drugs and violence. Any particular pair of shoes could be up there for a variety of reasons, though it’s probably not a place to buy drugs. And so, we may keep trying to explain sneakers hanging from power lines. But if the data proves anything, this looming question, the mystery of why and how sneakers arrive on power lines, is becoming a mystery of the past. Matt Latourette, 43, was shocked when we read him the raw numbers of shoe removals: more than 6,000 over the past seven years. “It’s amazing that there were that many taken down!” he exclaimed. Still, as a kid, he said he saw them all over the city. Today, Matt lives in Aurora, and rarely sees shoes hanging anywhere since their power lines are underground. But back in his old neighborhood, it was a different story. “I noticed it all over the city and it was just something that was stuck in my mind. I was always wondering why,” he said. He, too, had heard all rumors about what the shoes meant: drug dealing, bullying, kids being bored. But since he had never tossed his shoes, and didn’t know anyone who had, he never learned firsthand why people had done it. It was always a looming question, he said, shrouded in urban legends.